Ottawa, ON - From November 27 to December 1, 2006, Elmdale Public School will be play host to an exciting demonstration of Art in Action. 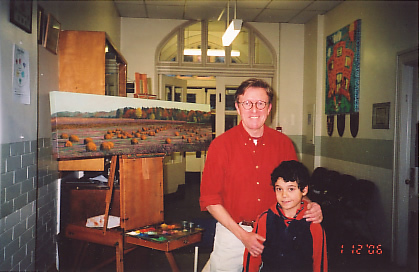 Renowned Canadian landscape painter David W. Jones will be this elementary school's 'Artist in Residence' for the week, during which he will commence and complete a painting of an autumn landscape. He'll also undergo close scrutiny in the process, with Elmdale's nearly 500 students paying daily visits to his easel to track the painting's process. David will be wielding his brushes in the school's front hall so students will have lots of opportunities to observe and interact with him throughout the various stages of bringing a painting to life. David W. Jones is not only an accomplished artist whose paintings hang in prestigious galleries and public buildings across the country; he is also the Arts Representative on Elmdale's School Council. As a member of the NAC-sponsored Parents for the Arts Network, David is committed to the goal of enhancing the place of the Arts in schools and building community support for and awareness of the value of Arts in education. For many years, staff and parents at Elmdale School have shared a common objective of providing materials and experiences which supplement and enhance children's education. Once again this year, Elmdale is focusing on the enrichment opportunities afforded through the Arts - including music, drama, dance and Visual Arts. While budgetary pressures have impeded many schools' abilities to deliver as much fun and fundamental Arts instruction as they used to, the Arts remain crucial to every child's education. Why do the Arts matter? Studies have proven that children who are exposed to the Arts not only enjoy school more, but develop a keen appreciation for many different aspects of the world around them. It is hoped that during David's week-long painting session at Elmdale, students will not only learn about the process of painting, but also about the inspiration and discipline that are fundamental to creating Art in every form. We invite you to come to the school and see David at work, to help highlight the importance of the Arts in education. The Artist in Residence diary is created by Debbie Holzman, www.holzman.ca. For more information, contact Paula Roy, Past Chair of the Elmdale School Council, at 613-722-5262 or by email at paularoy@sympatico.ca. Visit David W. Jones' website at www.davidwjones.ca. Elmdale Public School is located at 49 Iona Street, Ottawa. 9 a.m. David W. Jones has arrived at Elmdale Public School and set up his easel in the main hall. He is ready to begin working on his prepared canvas, which he has covered with his customary layer of burnt sienna paint (a process called imprimatura). This preparation must be done at least several weeks prior to commencing a painting, to allow the burnt sienna to dry thoroughly. David explains that there are two reasons for his colour choice for imprimatura: because his palette is a similar colour, it allows for a better correspondence between palette and canvas when he is mixing paints. In addition, the burnt sienna colour also lends a warmth to his paintings in that it shines through the paint applied on top of it, because of the natural translucency of paint. 9:05 a.m. With a diluted ultramarine blue, David does a rough sketch to place the composition onto the canvas, a process called alla prima. This sketch serves to make sure the composition will fit nicely onto the canvas; it will not matter that much of the detail will be lost as he begins to apply paint. 9:30 a.m. Now David is blocking in areas of the painting, a process he also refers to as 'scrubbing in'; this process is important because it gives him greater control of the various elements in the composition. Already his colour choices are being affected by the warmth of the light he wants to convey in the picture. He knows he wants the sky to be blue, because it will offer the greatest contrast to make the pumpkins stand out more (blue is orange's opposite on the colour wheel), but he is adding yellow to the blue of the sky to give it the warm glow he wants, making it appear somewhat greenish. He notes that at this stage anything can change because it is a foundation layer. 9:45 a.m. David pauses in his blocking to mix up four different hues for the pumpkins, blending orange with white, yellow and cerulean blue. He needs different hues to represent both lit and shadowed areas of the pumpkins. 10:30 a.m. Throughout the morning, teachers bring their students to observe David at work. The children are excited to watch the painting slowly develop, and full of questions, such as, "Is making this painting hard?" David responds that, "Yes, making each painting is hard, but that is one of the reasons I love being an artist." Several students want to know why he became an artist, and David relates the tale of how he loved to draw as a young boy, and was encouraged to pursue his passion by a teacher. Simon, a Grade 1 student, asked, "When you were little, did you start off with paint by numbers?" The answer was yes. 11 :15 a.m. David has inserted rough, dark shapes to represent the pumpkins in his painting. He is now adding some blue in the area around the pumpkins. The painting appears tonally dark and cool in temperature (and some students mistake it for water). David explains that most artists who work in an opaque medium prefer to progress from dark to light. As he continues to work on the piece, he says he'll have fun bringing light into the painting; this will cause it to change quite dramatically. A student walking by stops to ask, "How many greens do you use?" David responds that he starts with two greens, but them mixes many, many others as he needs them, so the number of greens is practically infinite. 1:30 p.m. Now almost the entire painting has been blocked in. David applies paint to all the outer edges of the canvas, then stops to closely scrutinize his work thus far. He is assessing the painting both for composition and the way things are placed spatially, debating with himself about moving the trees on the left hand side further into the background. He decides to achieve this by lightening them; he works some of the sky colour into the trees, thereby creating a veil of atmosphere between the viewer and the forest. He'll now move into the fourth phase of the painting (first was the thumbnail sketch on paper, second was the alla prima or rough sketch on the canvas, third was the blocking in). In this phase, he will be much more deliberate about the mixing and placement of colours, and will work with a greater variety of brushes than just the two larger ones he's been using up until now. 2:00 p.m. Another group of students stops by to check out the painting and ask questions of David. He explains to them that while he does have a photograph of the scene he is rendering perched on his easel, from the perspectives of composition and colour he is not trying to exactly replicate the photograph - he is just using it as a reference. "I can vividly recall the mood, atmosphere and temperature when I took the photo - that is important to me because I typically paint en plein air - outdoors in the very landscapes I depict," says David. 2:30 p.m. Preparing to start work on adding more autumnal tones to the trees, David takes a step back to look at the rhythm of the painting. "I want to make it flow from left to right and back again; I also want there to be a sense of movement to draw people into the painting," he explains. Some students return for their second or third visit of the day and are amazed at how much the painting has evolved. One student asks why David seems to favour "long, skinny paintings". He tells them that he believes canvases of this shape are an ideal way to represent Canada's vast, panoramic landscape. 9 :10 a.m. After storing his painting and palette overnight in a cold place to slow down the drying process, David is getting ready to go back at work. He likes cold storage because he prefers to work in a technique called "wet on wet" which means that he likes to apply paint on top of wet paint. David enjoys this technique because not only does it make it easier to blend and mix colours, he also feels it contributes a great deal to the subtlety of the colours. Although he also works in watercolour, for this painting, David is using oils. He creates his medium by blending the oil paint with equal parts of paint thinner, linseed oil and Damar varnish. These elements help to smooth and extend the colour, as well as giving the painting added lustre. 9:45 a.m. David has been working on the negative space at the top of the painting. He is defining the contours of the trees by painting in the sky at the tops of the trees, rather than painting the trees into the sky, which adds wonderful dimension to the painting. Further negative space will be interspersed among the trees to give a lacelike effect with the light shining through the forest in places. The process at this point is slower and more meticulous than much of yesterday's work. 10:30 a.m. David talks to school board trustee Jennifer McKenzie who has stopped by to see his work. He explains to her that the purpose of spending the week at Elmdale is to expose children to art in a direct and meaningful way, in the hopes that this will foster a lifelong love of and appreciation for the arts. 11:00 a.m. Senior Kindergarten teacher Mme. Nicole Martin brings her class down the hall to observe David in action. She shows her students a copy of the photo and sketch that David is using as references for this work, explaining that they too will be creating their own masterpieces. She carefully points out that their drawings do not have to look exactly like David's; they will be their own interpretation of the scene. Several children want to know when they will be able to see the pumpkins, which are presently represented by dark shapes. David decides that holding off on adding colour to the pumpkins will be fun, as it will have more impact on the students when he finally does it. One student asks, "Is it finished yet?" David replies that, "No, this is only the second day. I have three and a half more days to go," to which the students responds, "but it's already beautiful." His classmate wonders, "How are you going to get more paint on there when you've used up all the space already?" 1:00 p.m. Mr. Browne's Grade 6 class comes to sketch in front of David's easel. They have been learning about perspective in their study of art and are trying to put this information to work. They carefully sketch their interpretations of the painting, with some students including the easel and other elements in the school's hallway. They'll return tomorrow to show their sketches to David, and continue their drawings by adding the artist at his easel to their pictures. 1:30 p.m. David's palette is a very busy space as he continues to carefully mix the exact hues he wants for each element of the painting. As he mixes, he picks up bits of the colour with his palette knife and holds them up near various areas on the canvas to see if he's created the colour he is looking for, and to see how that hue will look in relation to other tones on the canvas. 2:00 p.m. David has intensified the pumpkin's shadows and started adding additional, lighter hues to the field area in the centre of the painting. He is finding his progress is a little slow this afternoon because so many classes are coming to visit, and he enjoys conversing with all of them. 3:00 p.m. David is now defining branches in the foreground by painting between them, similar to the technique used to define the forest in the background. "This contributes to the sense of depth," he explains. "As I suggest detail in the foreground by painting the negative space of the field, the front of the painting moves forward, becoming a barrier which the viewer steps over to enter the painting." He'll work just a little while longer before putting the painting back in cold storage for the night. 9 :10 a.m. David is starting his day at the easel by inserting warm colour that will be a source of light throughout the painting. He notices that when he added light to the pumpkins, it immediately changed the whole canvas, so he had to start adding light in elsewhere. He is working with smaller brushes at this point, and constantly stepping back to re-assess the painting. He notes that from a time perspective, progress is very slow right now. "I'm doing something that will pay off in the end, but I wish I was working in bigger strokes like yesterday," David explains. 10:00 a.m. Students are very pleased to see that the pumpkins are beginning to be transformed from rough shapes. "Now it looks more like a pumpkin patch," several of them remark. David is now moving all around the painting, adding highlights in various places. "If I only add them in one area, the context remains unchanged in other areas. I prefer to have the whole painting progress at the same time so that it does not become disjointed," he says. 10:40 a.m. A kindergarten class wants to know more about how David mixes paints on his palette. This sparks a conversation about light and darkness, and an explanation about the sky area in the painting. "Are you going to keep it greenish?" asks one boy. David explains, "It will stay this colour because what you are really seeing is not a green sky - it's a blue sky that's been warmed up. I added some yellow paint to the blue paint, and that's why it is this colour." "Do you ever sell your paintings?" one boy wants to know. "Yes, I am lucky enough to do this for a living. Isn't that great?" replies David. 11:15 a.m. David has removed the photograph upon which he is basing the painting from its resting place at the top of his easel. He is holding it up close to where he is working and referring to it frequently, to make sure he is successfully using some of the pumpkins in the foreground as anchors for the way the light is playing across the field. An older student who has stopped by with her class asks, "In composing the painting, did you add anything or take anything away from the photograph?" "Yes," answers David, "I decided to break up the band of trees which appears as a solid line in the photo into three sections, then moved one forward and one backward, to give the painting greater depth." 1:30 p.m. The first visitors of the afternoon remark that the painting is becoming both lighter and brighter in tone. They also notice that the trees have more colour and volume. Students ask about David's use of colours; a discussion ensues about thinking of colours as temperatures. David explains that cooler or duller colours help the background of the painting recede, while the warmer or more intense colours becomes, the closer the objects appear to the viewer. 2:30 p.m. David is now applying small brush strokes of the intermediate 'pumpkin' tone to a band of dark pumpkin tone running across the middle ground of the painting. These strokes represent the heaps of pumpkins piled up on the field, and serve as a great lesson for visiting students on depth and perspective. They are able to understand these sometimes challenging concepts simply by observing how the brush strokes diminish in size as he moves further towards the background of the painting. A teacher asks David to explain the relationship between geometry and art. He recalls the words attributed to post-Impressionist Paul Cezanne, who once remarked that if one can draw or paint with confidence the four geometrics shapes with volume (sphere, cylinder, cone and cube), then one can draw or paint anything in the world. David agrees. 3:00 p.m. A group of kindergarten students stops by for one last look before heading outdoors to play. They are unanimously of the opinion that the painting is "very, very beautiful". As the week is progressing, all the students' questions are becoming more interesting and complex. This afternoon, David was asked, "Is there any way to estimate how much paint you're going to need so you know how much to mix up?" David responded, "I find it much easier to mix more than I need and throw away the excess afterwards - it is too hard to try and mix more of a certain hue later on." 3:20 p.m. Mollie, a Grade 6 student, wants to know why David starts out with darker colours and not light ones. "Because oil paints are opaque, I prefer to do it in this sequence; it is one of the luxuries of working in a medium with opacity," explains David. "This allows you to reserve highlights till the end of the painting, which literally brings the scene to life." 9:30 a.m. David has started Day 4 on this project by continuing to intensify the colours. As the photo shows, in one area he has chosen to add a swath of a lighter green hue to the left hand edge of the canvas, in front of the trees. This causes the trees to appear more forward in the painting. He is also adding brush strokes to link the band of pumpkins to the areas in front and behind them; this helps to anchor the pumpkins in relation to the rest of the canvas. As he is working, he is contemplating how to approach the immediate foreground. He eventually decides to scrub at it with a broader brush and see how it evolves. 10:30 a.m. David is in constant motion, continuing to make small adjustments all over the canvas. He is introducing new hues, including a beautiful pale purple, so that the complexity of colour is more uniform throughout the painting. One student wants to know why there are two photos joined together, perched at the top of the easel. David explains that he almost always travels with his camera, and when he was at this farm to buy pumpkins in autumn, he was struck by how beautiful the scene was. He took two pictures side by side to better capture the panorama of the setting, and then joined them together to make the image he would use as the basis for this painting. Another student wants to know why there is purple in the field, amongst the pumpkins. David explains, "when I saw this field, it had a lot of dirt showing. If I just painted the dirt as brown, it would lack interest. I have chosen to represent the shadows of the clumps of dirt in a cool, purplish hue to give the painting more texture. 12:45 p.m. David comments that today he is hardly referring to the photographs upon which the painting is based. Instead, he is focusing almost exclusively on the painting itself; embellishing some things and obliterating others. His choice of the wet on wet technique gives him the freedom to make these changes as he wishes. "For the benefit of a good painting, I have to be willing to take things out, if they aren't working." 1:15 p.m. While Grade 6 students sketch their interpretations of David at his easel, he reminds them of the steps to make this painting, beginning with the photographs, then onto the thumbnail sketch and then to working on the canvas itself. He explains to them that ideally, for a painting to develop properly, it should evolve as a whole. "You don't want to concentrate on isolated elements without considering other areas at the same time," he says. He also explains how the source of light (in this case, it is coming from the right hand side) casts itself on all the object in the painting. Thus we see that the right hand side of the pumpkins, the leaves, etc. are all lit, while the left hand sides are in shadow. The students remark that their sketching activity is a difficult one, but they all seem to approach it with enthusiasm and diligence. 1:45 p.m. As David continues to make adjustments to the foreground, a group of students speculates that the painting is going to look quite a bit lighter when David is finished; they base this opinion on how much lighter the painting appears today versus yesterday. David admits that he doesn't really know himself how light it's going to end up - he's letting the painting lead him, rather than imposing a preconceived idea of how it should look upon completion. The students express their confidence that the painting will be completed by end of day tomorrow. 3:30 p.m. David is putting highlights on additional pumpkins. "I am doing this so I know how bright to make the surrounding earth; highlighting the pumpkins changes the context yet again," he notes. "Thank you to all of you involved in making this happen at Elmdale. What a wonderful opportunity for our children to witness art in action. Every night at dinner we have talked about the progress of David's work. My girls compete to see who can give us more info. It is programs like this one that make an education rich and full. Thank you David. Thank-you members of the council who supported it. "Nice to see an old media master making use of modern technology to reach a broader audience. The Blog medium will yield a great teaching resource for the school and pulls in a broader community. A great idea with a nice implementation. A great complement to your wonderful volunteer effort. Congrats." 9:10 a.m. David is reflective as he embarks on this, the last day of his week as Elmdale Public School's Artist in Residence. "As with every painting I make, my aim this week has been to create a successful work that will sustain people's attention for a long time - maybe forever. There should be enough complexity in a painting to achieve this. I also hope that I've created something that allows people to step into the scene and be touched by it." 9:30 a.m. The first class to visit today is pleased to see more brightness in the pumpkins, a source of much attention and interest all week. David, in turn, is pleased to see many of the students wearing orange-coloured clothing, just as he is. David himself urged all students to wear orange today, for he felt that, "if we all wear orange, it will make the pumpkins jump!" Questions today include wondering how David can stay so clean while he paints. "When I paint, I get the paint all over myself," confesses one young girl. "I have been painting in oils for over forty years," explains David. "I have had a lot of training and developed some good work habits over time which enable me to keep both myself and my work areas clean." Another student wants to know why David has extended the painting onto the outer edges of the canvas (those that are wrapped on the wooden frame). David says, "I am not sure yet how this painting is going to be displayed or framed so I am painting the edges in case they remain visible, even though they might end up being covered up." 10:15 a.m. As the painting continues to take on colour, it becomes even more lifelike. David says that when one is painting something that has volume, such as a pumpkin, the artist should put a bit of reflected light on the shadowed portion of the object. This device serves to draw the eye around the object, thereby increasing the appearance of volume. Numerous parents stop by to visit David at work. Most have come to the school today because of their children's enthusiasm in discussing the project at home. Dawn, a mother of three young Elmdale students, comments that her children have been very prolific in their own artistic endeavours at home this week, likely because of David's inspiration. "I am so glad he is doing this for Elmdale and its students," says Dawn. 11:30 a.m. A favourite question posed by adults this week has been, "how do you know when you are finished a painting?" It is asked again this morning. David replies, "When I stand back and see what else has to be done, and I don't see anything, then I know a painting is complete." Ironically, the kids have been saying for days that it looks finished to them. The concept of layering paint has not yet occurred to many of them, especially the younger students. 1:15 p.m. There is a sense of dénouement as David works towards completion of the painting. He has noticed that there is one brighter tree in the background that he would like to diminish in attention; when he goes to work on enhancing nearby trees he discovers that this part of the painting is now too dry. He needs to remix some of the area's existing colour and apply it so he can proceed with his wet-on-wet technique. 2:00 p.m. By this point, David has done a wonderful job of enhancing other trees to give the background a beautiful vibrancy. He has also added a few more highlights to the pumpkins and is now continuing to tweak the foreground. Many students passing by comment that the trees are their favourite part of the painting. This comes as a surprise; we had initially expected that it would exclusively be the pumpkins that captured their interest and attention. 2:55 p.m. One of last classes to visit this week sits down at David's feet. Rather than ask questions, many of the children want to offer comments. In addition to telling David how beautiful the painting is, they also want to share stories about their own artistic endeavours. Several students want to know where he gets his art supplies. Others want to know when he will be done, and we talk about the process of understanding when you are finished a piece of art. Visible on the wall to the left of David's easel are the pages of this blog, printed out. Many students and visitors to the school were intrigued to see the painting's evolution over the course of the week depicted this way in words and pictures. 3:15 p.m. Writer Paula Roy, Artist David W. Jones and Web Designer Debbie Holzman - this week's "Art in Action" team. 3:41 p.m. David applies his final brush strokes. "I think that's it," he says. "It has been my sincere pleasure and privilege to spend this week as Elmdale's Artist in Residence. I have enjoyed the opportunity to have students, staff and visiting parents observe me as I created a painting of a pumpkin patch in autumn. The children's questions have been thought-provoking and interesting; I have been truly impressed with their curiosity and enthusiasm for this project. We dubbed this week a demonstration of "Art in Action" and I feel it has achieved its goal of helping students learn in a very memorable way how art is created. I hope that it is also achieving our other objective, which is to foster a lifelong appreciation of and love for the Arts in all forms. I am particularly grateful to the staff of Elmdale for their continued efforts to make sure the Arts have a prominent place in our children's education."